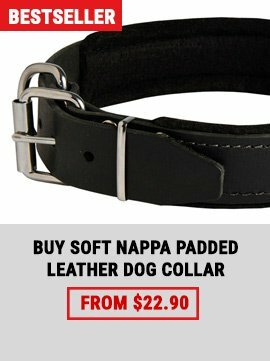 Your dog misbehaves and it is very hard to control him? 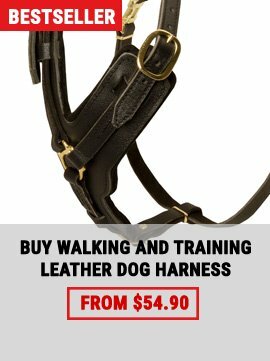 You need special dog equipment for obedience training? This Exquisite First-Class Quality Leather Dog Leash will perfectly help you to keep your lovely pet under control. 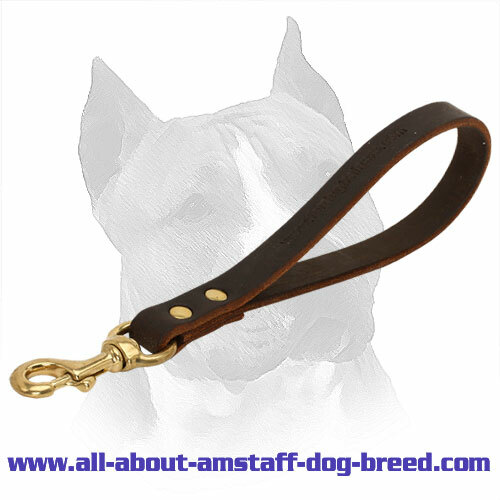 It is manufactured of the strongest 100% full grain genuine leather which will not probably tear or stretch in years. 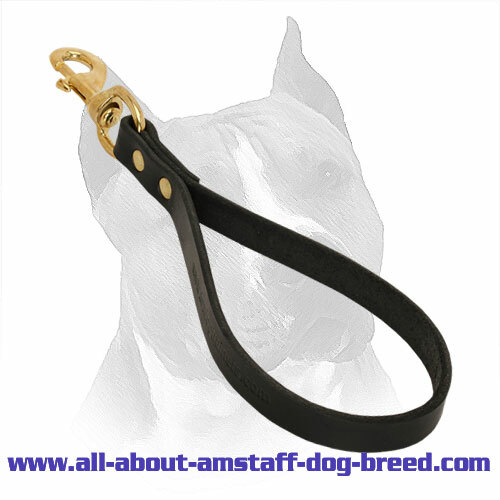 Due to its short length it is very easy in use. Just one motion of your hand and the dog is next to you. Besides, the handle is specially padded with extra soft Nappa leather. That’s why it will not harm your palms. Don’t miss your chance! 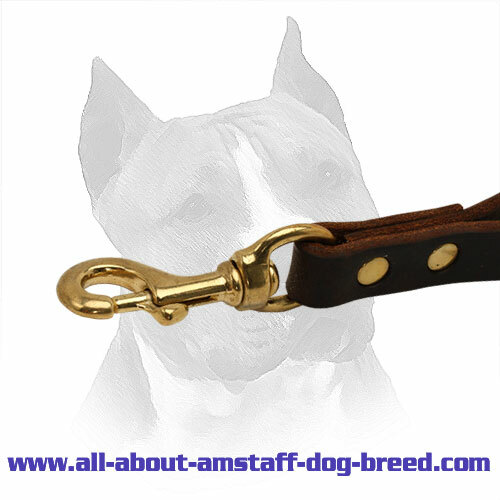 Provide your Amstaff with the most qualitative professional dog supply! 1. 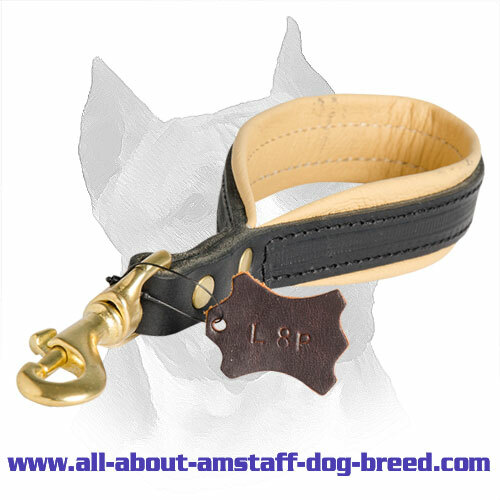 It is made of extra durable 100% full grain genuine leather which makes the leash super strong, wear-well and time-proof. 2. It is very comfortable because this leather is very gentle and agreeable to the touch. The handle is covered with a special Nappa padding which protects your palms from rubbing or any irritation. 3. The fittings are made of brass metal which provides them with durability and shining golden color. They are resistant to rust and corrosion and will serve you for a long period of time. 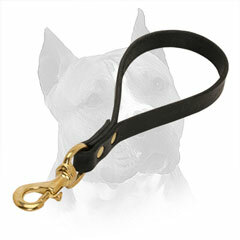 The leash is equipped with a strong snap hook and a floating ring that help to attach the supply to a collar. 4. It is specially stitched and fixed with golden rivets for additional durability. 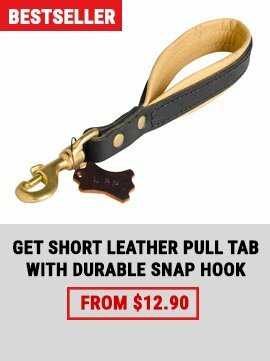 You will surely enjoy the leash with your pet for many years. 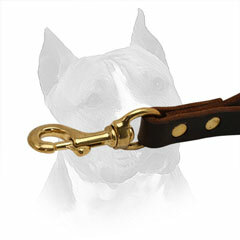 If you want the leash to look like new for decades, never wash it with water or dry it on the radiator. Use special water repellent and leather conditioners.